Can it really be spring? Sure doesn't feel like it outside but we are busy at the library planning for spring and summer. Once again we are planning summer programs for all ages - babies - adults. Last year we welcomed a record number of people (just over 12,000) for over 130 programs in June and July. Our goal is to come up with creative ways to make learning fun and challenging while emphasizing reading proficiency. friendship and teamwork. 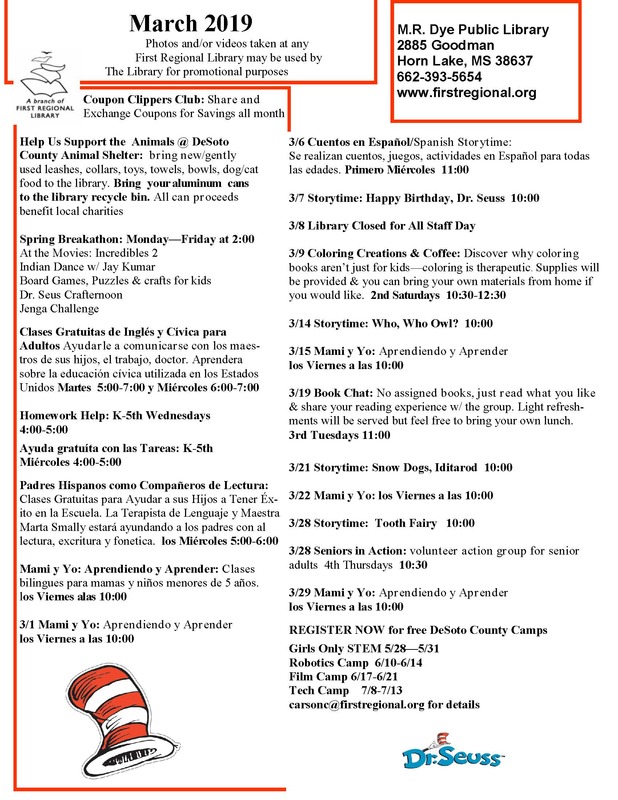 The library's Spring Breakathon offers entertaining projects each day and we begin the month with an all star Read Across America salute to Dr. Seuus (he would have been 115 years old on March 2.) We have been blown away by the enthusiastic response to our most recent calendar additions - Coloring Creations and Coffee and Book Chat. Check out for yourselves these creative outlets and camaraderie. The library continues to participate in and support a variety of community efforts - Clean up Horn Lake, Home School outreach and Excel by 5, language and civics classes, DeSoto County Schools initiatives and business roundtables. Registration for summer camps (Tech, Robotics, Girls Only Stem, Film and FBI Academy) is underway - contact me at carsonc@firstregional.org for camp / academy information and applications. We welcome the opportunity to be a resource for your business / organization and to support your thoughts and goals. Don't be a stranger - find out why the Horn Lake Library is your destination of choice.